Only 60 miles (100km) separates the island of Fuerteventura, second largest in the Canary Islands, from the continent of Africa, and this sunny island shares the same latitude (and therefore similar weather conditions) with the renowned holiday destinations of Florida and Mexico. Unlike those bustling resort-ridden vacation stations though, much of Fuerteventura is relatively undiscovered, with more than 150 idyllic sandy beaches only sparsely populated and many seldom visited at all. The name of the island comes from the strong trade winds, which have made it a popular stop for windsurfing and kite surfing enthusiasts. The island has an arid volcanic landscape, and apart from the beautiful beaches and a handful of developed tourist areas, not much to recommend it in the way of tourist amenities or attractions. This has kept the mega resorts and mass summer package-holiday trade at bay, but Fuerteventura does have a fair share of day trippers from the resorts of Lanzarote and Gran Canaria who come seeking a respite from the crowds. Fuerteventura is the ultimate Canary Islands destination for those wanting to get away from civilization and crowds and enjoy a sleepy, sunny holiday. The island's two main resort towns are Corralejo and Caleta del Fuste. 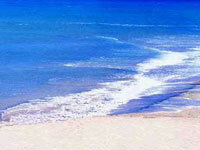 Fuerteventura is easily accessible from the other islands in the archipelago by ferry or air. The Fuerteventura airport is situated close to the island's capital of Puerto del Rosario.